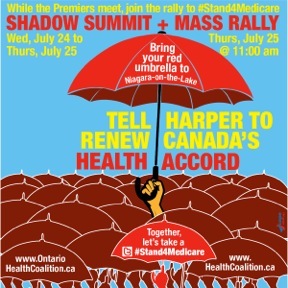 Many thanks to everyone for coming out to last week’s Shadow Summit and Mass Rally to Uphold National Public Medicare and win a Renewed Health Accord in 2014. More than 2000 people came out to call on the Premiers during their Council of the Federation meeting in Niagara-on-the-Lake to demand that Stephen Harper return to the negotiating table for a renewed Health Accord. Our goal was to put health care on the agenda as this was the last Council of the Federation – a meeting of all the provincial and territorial Premiers from across Canada – before the expiration of the Health Accord in 2014. We are very disappointed that Ontario’s Premier Kathleen Wynne did not agree to come out and join the rally and speak in support of public health care and that the Premiers did not heed the call of the mass of supporters of public health care and take this opportunity to stand up to the Harper government’s extensive cuts. The Harper government has been actively undermining health care and has walked away from its role in upholding the values of a public, non-profit health care system. The Premiers did announce that they’re going to ramp up the bulk purchasing of pharmaceutical drugs including 17 brand name drugs and 10 generic drugs, which they believe will save $100 million. While this is a small but positive step, it is a far cry from the $10.7 billion that could be saved through the cost-containment measures of a National Pharmacare Plan. Again, thank you to all the supporters of public Medicare that came out to show their support. This is just the beginning of an escalating campaign to win a renewed Health Accord and get the Harper Conservative government back to the negotiating table! We will be distributing materials and getting new updates out very soon.